Spring peas are one of my favorite things that come out of my vegetable garden. They are always the first thing I plant, usually in late February or early March, so for me peas represent renewal and the start of another growing season. In my garden, there is a window of about 3 weeks to enjoy the peas starting in early June. I was fortunate to have deterred Newman, my little bunny nemesis who earlier in the growing season was making a smorgasbord out of my pea shoots and leafy greens. 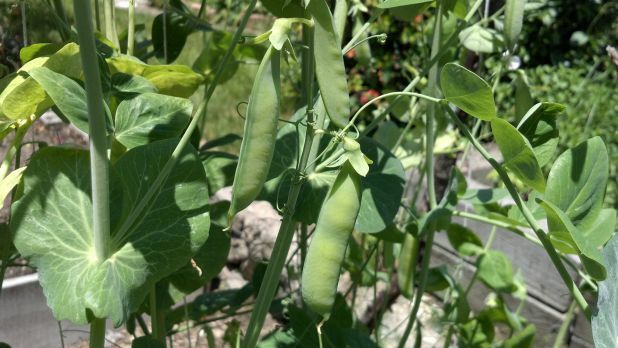 The last few weeks of rain interspersed with warm and sunny days provided just the right conditions for the peas, and the past week has seen an explosion of ripe pods ready to pick. What’s so great about fresh peas straight from the garden is that they haven’t been sitting around like those from the supermarket, and because of the relatively high sugar content in peas compared to other vegetables, those sugars have a tendency to turn to starch (ever boil peas, even the frozen variety, and end up with them being overly starchy?). It’s for this reason that other produce items turn starchy as they age, such as bananas, potatoes, apples, and tomatoes, all of which develop an off-putting mealy texture. With fresh peas, all you need to do is shell them and boil then very quickly – no more than two minutes – and then toss them with a bit of butter and sprinkle with salt. Right now in the garden my tarragon plant is growing like crazy so I chopped up some of this and added it to the peas for dinner last night. The two go quite well together. When using the peas in a recipe, I’ve found it’s better to add the peas toward the end of cooking, since they need such a small amount of cooking time. My all-time favorite dinner that has peas in it is mutter paneer, which can be made with fresh or frozen peas. I just made a batch tonight with the waning bounty of my pea vines. Leslie and I savored every bite, knowing we have but a few meals with fresh peas remaining. Bring a large pot of salty water to a boil and add the peas. Boil for two minutes, then strain through a colander. Move the peas to a bowl and toss with the butter and tarragon, then season with salt to taste.